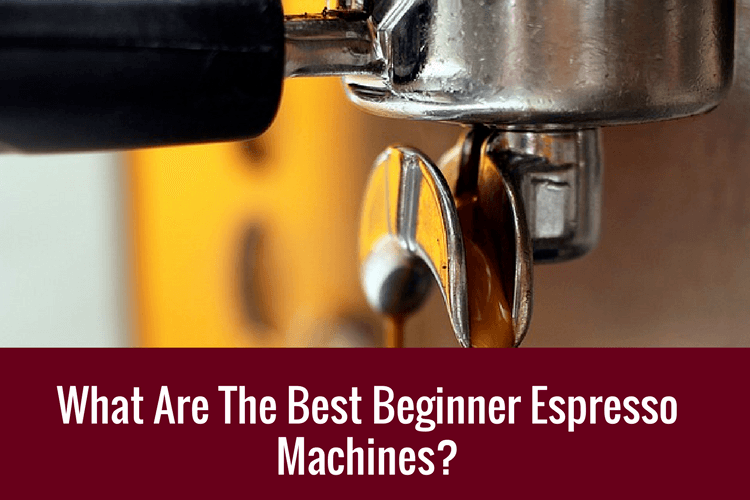 [REVIEW 2019] What Are The Best Beginner Espresso Machines? What Are The Best Beginner Espresso Machines? So you are just getting your feet wet? There are a lot of espresso machines out there and it can be very hard to find one if you have no idea what to look out for. While It is not wrong to think that espresso machines do is make (awesome) coffee, but there is more to it. Follow us as we journey to the world of espresso makers to help you find the best beginner espresso machine for newbies. After we go through what to look out for, we will give you a couple of options that we think is suitable for beginners. Of course, we will provide our opinion with reviews of those machines that we suggest. Espresso is just one of many types of coffee-making methods. Many choose Espresso machines as they come with many advantages and benefits. The most obvious one is the speed in which you can make barista quality coffee in your own kitchen. Depending on the machine, this will be done much faster than in a coffee shop and will taste just as good, letting you enjoy your morning cup in the peace of your own home. Another is convenience as it allows you to have coffee whenever you want, with the luxury of your own machine you can try all sorts of different types of coffee at just the push of a button. What You Really Want It For? This is a super important self-inquisitive question you should consider. Are you trying to get the machine with the best aesthetics to complete your kitchen? Orthe one with an arsenal of functions to suit every family members’ needs? or simply the no-frills machines to make that needed cup of joe? How Do Espresso Makers Differs From Each Other? People may see espresso machines as being the same, but they couldn’t be further from the truth. Obviously, quality of the product is a differentiating factor. In this case, quality really means consistency of brew for a long time. You would not want a machine that brews espressos that taste differently every time. There are also many other differences such as the degree of control,, the type of coffee used and repair and restoration. These can all change your view of making coffee and the machine itself meaning you should be looking out for anything that would affect your coffee drinking experience. Degree of control means that if you would want the machine to control every step of the process or you would want to have some or full control. Super-automatics give the machine full control of the brew. This is often chose by users who just wants the brew and nothing of the complications. Capsule machines falls in this category as well. On the other hand, if you wants to be part of the process and learn to be a barista or sorts, you can consider the semi-automatics. Manual espresso machine are often used by outdoor-enthusiasts who can’t get away with coffee. Type of coffee used is a big one, with either capsules, ground coffee or fresh coffee beans being used depending on the machine. Out of these three, capsules are seen as an easier way to make coffee, with the ground coffee within the capsules being prepared in mere seconds. in addition, it is more convenient to get capsules than beans. A capsule machine would definitely be a good way to start getting into making your own coffee with its ability to make good coffee but without the complication of grinding your own beans. This can be seen in this article comparing coffee beans with capsules. The different components within the machine is also something to look for when weighing up your options. Will you be able to get spare parts if it breaks? Will you understand what is making the coffee? Is it easy to use? These are all questions that can be answered by looking at this glossary of espresso machine parts to give you an idea of what you are actually buying. After reading this, you’ll be able to tell the difference between a Caldaia and a Gruppo. Watch the above video to give you an insight into choosing an espresso machine, with details of different types of espresso machines and what they do, helping you to choose based on your own preferences. We have went through what you should consider when choosing your first machine and we want to make things even more simpler for you! Let's take a look at the 5 best beginner espresso machines that you can consider. As we mentioned, the capsules machine is for people who wants things to be very simplified. If you are, consider the Nespresso Inissia. This Nespresso machine takes Nespresso coffee cartridges and can make espresso in seconds. With a built in water tank to make the espresso, it can hold up to 24 ounces of water for use with the coffee pods meaning less time between cups and more time drinking coffee. Taking only 25 seconds to get the water to ideal temperature, you will have your coffee ready for you in minutes and with an inactivity timer, your machine will power off after 9 minutes without use, saving you money on your electricity bill. A good and bad thing about capsules is that they are pre-made. Which means you save the hassle of making your own grind. On the other hand, it also means you will have to pay for them to use it with you machine. This might somewhat increases your costs per cup a little. But really, the advantages outweighs the costs in our opinion. The model comes with a steaming and frothing milk function and with a smart plastic exterior you probably cannot go wrong. There is also a huge range of coffee flavours available for this model to fulfil all your caffeine, or decaf, needs. Overall, espresso making has never been easier as all you have to do is turn it on, put in your coffee pod, press a button and wait for your espresso to come out. When finished the pod drops into a smallholder that holds up to 11 capsules at one time creating less mess for you. An espresso machine that not only lets you make espresso but also a range of other types of coffee? Yes please. This semi-automatic machine makes your espresso, cappuccinos or even lattes and with this variety you will be able to change what you want to drink when you want to drink it. The drinks selections could not be easier with a simple control panel that lets you pick the beverage you want and what size you wish to have it in. Fitting the grounds into a filter is no trouble as you merely select the size you would like, fill it up, and then put the filter in the machine. There are 2 selections, single or double shots portafilter. With automatic milk frothing when making cappuccinos and lattes, you won’t have to push any extra buttons while waiting for your coffee to brew. Cleanliness is less of an issue with the removable water filter, as it is easy enough to wash up in the sink after removing from the machine. Though, it would be better if you clean the machine regularly and to a high standard to keep the machine in perfect working order to avoid the machine failing. With the machines sleek silver finish, it is aesthetically appealing too! Enjoy your freshly brewed cup of barista quality coffee moments from pressing the button. This espresso machine, brought to you by Breville, comes in several finishes. You can select this machine in stainless steel, cranberry red or black sesame, allowing you to pick the best color to suit your kitchen. It has a built in coffee bean grinder to allow you to obtain fresh coffee while tweaking the amount ground to suit your taste and with a programmable shot function, you can pick whether to have single, double or anything in between. The Purge Function automatically adjust the water temperature to get the best espresso brew. Perfect if you are do not want the hassle. A range of accessories are available with purchase permitting you to be your own professional barista. You can use the cleaning kit to keep the machine in perfect working order while making sure you get the perfect dose of coffee with the precision razor dose trimming tool (PID), and much more. The thermocoil heating system will keep your coffee piping hot while you wait for it to brew and the built in pressure gauge will get you that perfect cup of coffee that you have been waiting patiently for. The machine comes with a one year warranty guarantee. This lightweight and portable espresso machine is perfect for nomads who are on the move and with no electricity having to run through it, it means that you can make your favourite beverage anywhere you want. The exterior, made of plastic, is lightweight and comes in Luminescent Green, Cobalt Blue, Paris Red, and Silk White, meaning you can pick the color to match any color scheme. Even though you have to do everything manually, it makes fantastic coffee in less than a minute. You boil the water and put it though the machine with you fresh grounds inserted and pump it out using the hand pump. This means you have complete control over how your coffee comes out. The idea of boiling your own water for the coffee may seem sort of defeats the point of buying an espresso machine. But, if you are constantly on the move, you probably want to reduce the weight of you baggage. In addition, this is a plus if you are someone who cares about the environment. With the stylish and lightweight design, it means that you are not confined to one place to make coffee, you can take it wherever you can boil hot water, be it to the office or even camping, giving you fresh espresso wherever you want it. This espresso machine looks both professional and easy to use. It is not as intimidating as other machines, with a simple button design that makes coffee making easy. You can choose to either use pods of freshly ground coffee with this machine, leaving you with more options of what to have. There is a ‘slide and lock’ function making the locking of the coffee filter in place easier than ever and the 15 bar pump allows you great tasting coffee shop coffee in a few easy steps. A slight issue that some may face with this machine is that some of the materials seem to weaken after several uses, both dampening the taste of the coffee and your expectations of the machine. But, with good care, this espresso machine should leave you with a well-made, tasty cup of coffee for some time. All machines, in some way or another, differs from the rest. All of them have good qualities and are suited for certain groups of people, be it for environmental purposes or just that it makes the best coffee. If we were to choose (or you simply scrolled down to have our choice). We would recommend the Breville BES870XL with its many different functions that mean everyone can get something they want. You can make different types of coffee with fresh ground coffee beans and the added accessories mean your possibilities are endless. As a solid machine it is unlikely to just break down on you but if spare parts are required they can be found easily online or in stores and is one of the finest models that Breville offer. That’s it folks. I am sure you know a thing or two about espresso machines now. Till next time!